We received a new shipment of fabric from Henry Glass Fabrics. You can purchase it at http://www.beehivequilts.com/. I thought it was a great idea. 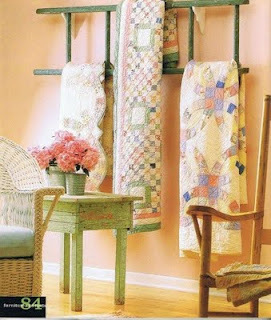 My dear husband built a quilt ladder for me, which I love. I would have never thought to turn it sideways and display in this manner. On another note, you might wonder what http://www.quiltingboard.com/ is. If you have not already found this site, it is one to check out for sure. You can read what you want on it without signing in. Or you can sign in and get to read and respond. 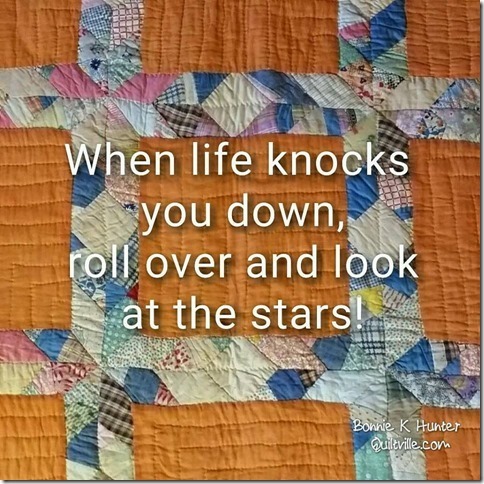 My favorite part is getting to see the portion where people submit pictures of their quilts. Gives me good ideas and makes me realize I have a lot to learn. People post good tutorials there, too. I high recommend it. In the sample above you can see you just add this little tag that says "ps., I love you" into your binding of your quilt or onto that cute little outfit or other projects. Really perks the project up and sends such a sweet message to the recipient of the quilt or other project. 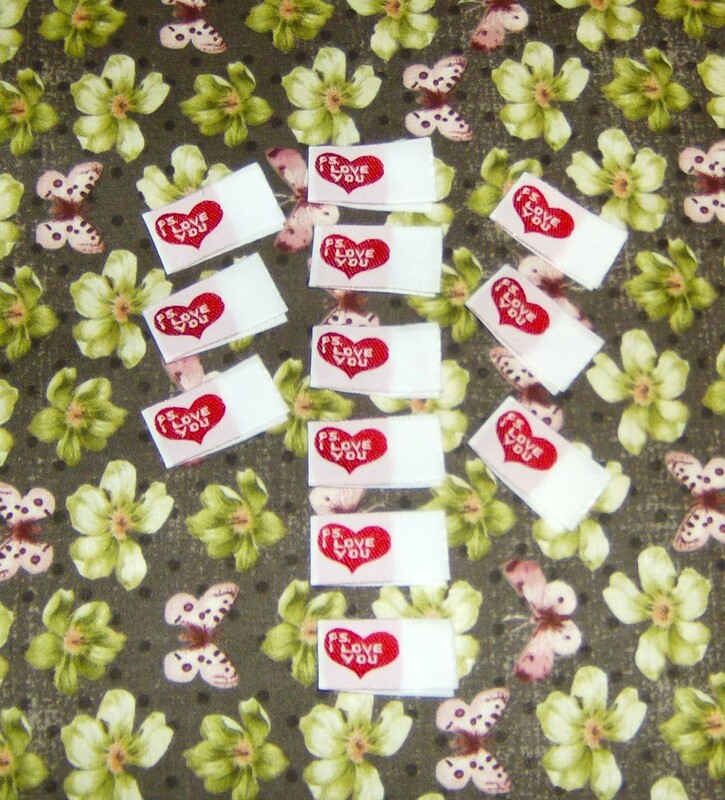 We have them on our website for only $3.98 per package of 12. Great buy. Find them at http://www.beehivequilts.com/psiloveyou. Do you like free patterns? I do. I came across the following site http://3creativestudios.com/free.htm. It has so many different projects that you could be busy for the rest of your life just working off this site. It even has a free BOM at http://3creativestudios.com/bom.htm. Pretty cool one at that. There are all sorts of projects you could make. There are patterns for notebook covers, quilts, placemats, all sort of items. I saved a few of them to make, too. Just remember they are copyrighted - for personal use only. Having been an owner of a local quilt store, I would always advise people to support them first. It is hard to make a go of it in this economy. Many owners never take a pay check out of it; all the money goes right back into the shop to make it better. Now that said there is a big box store that I will shop at occasionally. That is Beverly's Fabrics. They just changed the Carmichael CA store from their normal craft and fabrics and house decor to just fabric. They carry most any fabric, but they have a huge section for us quilters. They carry brand names just like the LQS does and of the same quality. They also carry very "cheap" fabric for those that just cannot afford the higher quality. I personally stay away from that fabric, as I am not going to make a beautiful top that will not last very long. 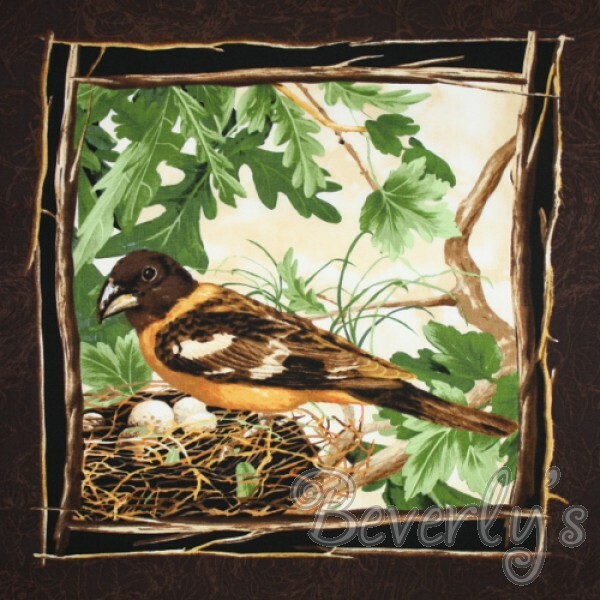 The Carmichael store and Beverlys.com has a fabric of the day for $2.97! Wow. I personally have purchased some, as has Elisa. We have not been disappointed. The website posts the new day's list at 9 a.m. PDT. 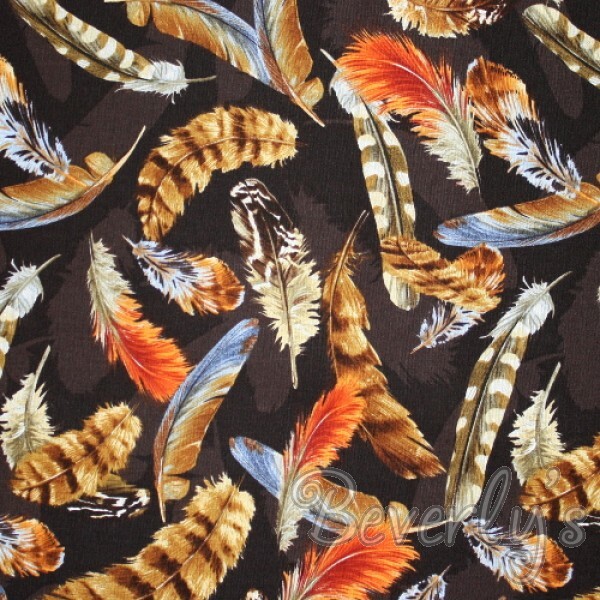 I try to log in no later than 10:30 a.m. because often the best of the three fabrics posted is sold out. They post what amount they have to sell. 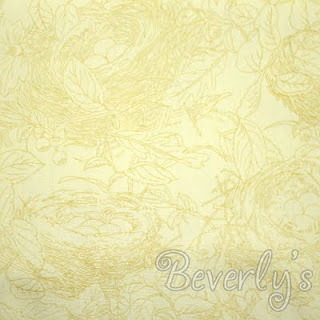 Take a look at it at http://www.beverlys.com/. Today's (Wednesday) is really neat. It has birds and nests and feathers. I have a friend that was asking if I had any bird fabric, which I do not. Maybe I will be nice and buy her some before it is gone. We received a picture of block 2 of the Wildflower Rhapsody BOM. It came from Garnalee in Idaho. She is now entered to win a copy of Sharyn Craig's Layer 'em Up book. 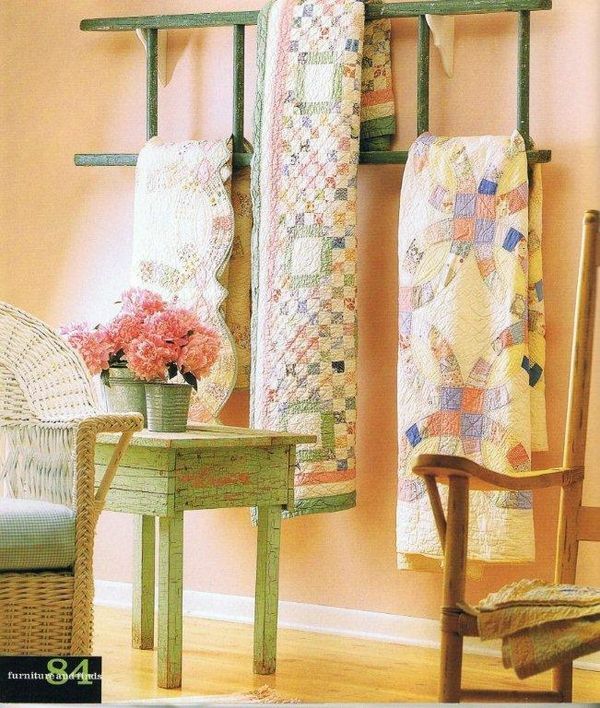 It is a book that contains patterns of "quilts that are fast, fun and forgiving." 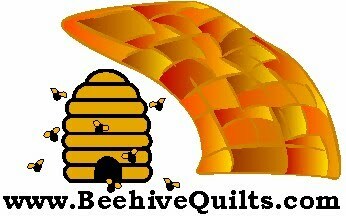 If you are doing Beehive Quilts BOM and want a chance to possibly win that book, too. Send us a picture of the second block at contact@beehivequilts.com. Drawing will be held May 31st, so the picture must be received no later than 9 a.m. on that day. 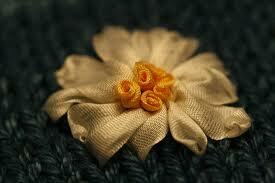 Have you seen or worked embroidery done with ribbon instead of thread. It is beautiful. It adds a dimension to your work that is unique. In researching for something totally different, I came across a link that shows how to thread the needle with the silk thread to allow you to start sewing with it. It also tells you what size needle to use. This is a great technique. I thought you might like to see it. 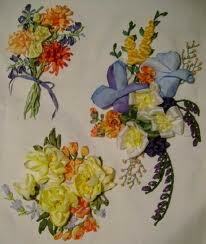 To see several examples of silk ribbon embroidery go to http://www.google.com/search?q=silk+ribbon+embroidery+ideas&hl=en&rlz=1T4GGIH_enUS274US275&prmd=ivns&tbm=isch&tbo=u&source=univ&sa=X&ei=32rITc-uCYK4sQOE4qCVAw&ved=0CDwQsAQ&biw=1245&bih=633. Pictures included on this post were talken from that site. Okay all you people that are working on Beehive Quilts' BOM, your May block has been mailed this morning. This block looks pretty easy. Hopefully I will get mine done before we have to cut next month's fabrics. My partner in business (and my daughter), Elisa, always says she never wins anything. When we go to quilt shows, we both purchase lots of tickets for their drawings. Neither one of us have ever won an opportunity quilt - yet. But I often win one of the door prizes. She won a great collection of fat quarters today. Clothworks posts collections occasionally on their blog and ask for feedback on them. She wrote in that she loved all of them and mentioned which one she loved the most. They chose her from a total of only 14 entries to win. When this new line comes out, she will receive her fat quarters - all just for saying she loves their fabric. It made me a believer. I am going to go to their blog to see their new fabrics every month, too. If you want to see the lines that were shown, go to http://www.clothworkstextiles.com/blog/?p=2629. She stated her favorite was Country Gardens. That is the line of fat quarters she will get. 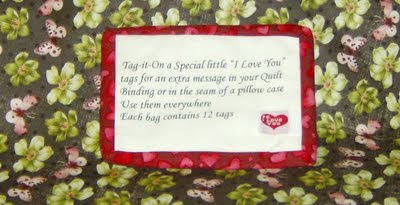 Makes it easier for her to Keep on Quilting!